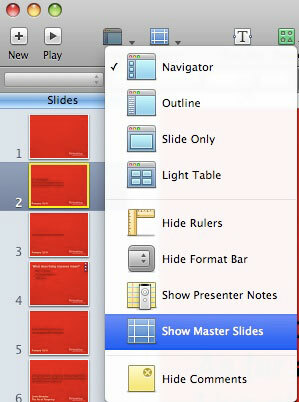 One of my favorite things about Keynote it that Master Slides actually work. I've spent hundreds of hours in PowerPoint only to be forever frustrated with their master slides. Sometimes they worked like I expected, sometimes they didn't work at all. 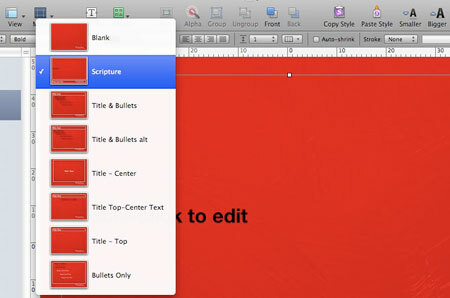 When I got my first copy of Keynote a few years ago, it was life-changing. It occurred to me that some people might be out there duplicating slides and changing text instead of simply using masters so I thought I'd run through a quick example or two on how we use them. You probably know that we use ProPresenter for all our presentation to screen. However, we use Keynote extensively to create many of the slides that end up there. The most obvious use is for sermon notes. We have a wonderfully talented designer that produces all of our themed graphics, and part of that package is a notes background. I take that background, drop it into my Keynote masters (most of which simply have to be tweaked from series to series) and the presentation operators make the graphics. Here's how it works. The first step is to create a presentation that matches your screen resolution—we use 1280x720 for our main screen. You can start with any of the Apple-supplied templates, but I recommend the basic white or black background. That will give you what you need without a lot of extras you don't. Next you'll need to view the Master Slides. From the "View" icon, chose Show Master Slides.Once you have them in the sidebar, you can select them and start editing. Nearly every master slide will include a Title Text and a Body Text box. Those become the basis for my masters. You can change the fonts, shadow, color, position, size of the bounding box and a host of other options. New in iWork 09 is a checkbox that will auto-shrink text in a text box to fit the confines of the box. This can be a great help for scripture slides. I have created a whole series of masters that accommodate almost any likely sermon note slide request. And when a new one does come up, I'll make a new master for it. I create a current series Keynote master file that I lock in Finder so our presentation volunteers don't accidentally over-write it. If I have to add a master or tweak it, I simply unlock it, make the changes and re-lock. We save a new Keynote file every week. Every time we change series, I drop the new background it the masters slides. I first delete the old one (no sense having it in there slowing things down), paste the new one in, then send it to back. I'll make any text position, format and color changes to match the design and we're done. I recommend hiding the Master slides once you're done editing. It's way too easy to select one when you're building a show and think you're creating a slide when you're actually editing a master. Don't ask me how I know this. In use, masters couldn't be easier. When you click on the + button, a new slide is created. From the Masters menu, choose your template. We'll select a template, in this case Scripture.Once the slide is created, you simply double click each text box to edit. You can type whatever you need to in each box, though I find that time-consuming and error-prone. Since our pastor normally sends us a Word document with his slides, we simply copy and paste—with a twist. If you copy text from a Word file, for example, it's likely to be 12 pt. Times. When you paste that into your master text block it will appear as...12 pt. Times. What gives? I thought masters worked in Keynote? They do, but you need to paste correctly. 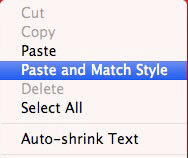 Once you double-click on the text box, Right-click and select "Paste and Match Style" from the dialog box. That will format your pasted text exactly the way the master text box is formatted. Perfect! The key to cutting and pasting.Once you get a good library of Master Slides, it takes but minutes to get the sermon notes formatted and ready for the screen. Once we're done creating the slides in Keynote, we export them as JPG files, import them into ProPresenter and display them from there. We could also play out from Keynote, but I like the easy, random access ProPresenter affords in case the sermon changes.